We’d like to think fashion’s obsession with youth will eventually come to a screeching halt. Along with antiquated ideas of what size constitutes a “model’s body” and the belief that women should exclusively shop in the women’s department, age has always been a way to exclude certain women from important conversations and exciting trends happening in the fashion world. Though the industry still remains quite enamored with youthfulness—just look to the runways of fashion week and the stars of major campaigns—we think the leaders below are helping to change that. 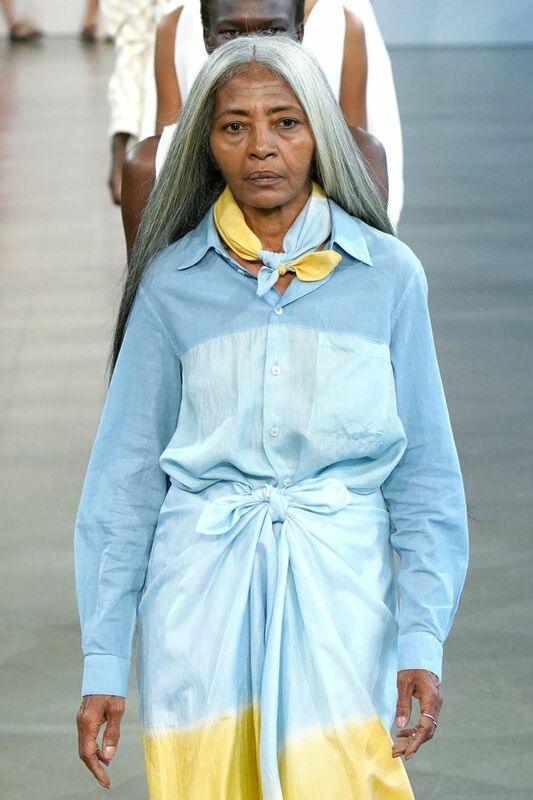 Coming off the heels of fashion month—specifically New York Fashion Week, which The Fashion Spot reported was the most diverse to date—we went seeking the advice of a few over-50-year-old models. In an effort to celebrate age rather than perpetuate stereotypes based on it, we asked them what is it about fashion that they understand and appreciate now more than ever before. Some reflect on how casting has become more inclusive over the course of their careers, others on the fact that now, in their 50s, 60s, and 70s, expressing their personal style has become more liberating than ever. Both give us something to look forward to in our own decades ahead. Scroll on to see what these wise women have to say. Where you’ve seen her: She made her New York Fashion Week debut in Tome’s S/S 18 presentation and walked the runway for the brand this past September, as well. What do you better understand and appreciate about fashion right now more than ever before? When I was growing up, there were rules. Fashion functioned with age appropriateness; variances from these were frowned upon. Models had to be a certain height and weight, and models of color were few. I am grateful to those who paved the way and still serve as continued inspiration. Today, there’s wider exposure to real people—more inclusion, along with freedom of style expression and creativity. I have been exposed to some incredible styles created by extremely talented designers. I am impressed by their concern for today’s woman of any size and any age. Fashion has become what works for you and how you work it. How does it make you feel? Are you comfortable? More importantly, it is being yourself and accepting who you are with or without clothing. Long hair or short hair, dyed or natural, curly or straight, makeup or no makeup. The beauty held within radiates outwardly and carries the fashion with it. Where you’ve seen her: Twin Peaks and The Mod Squad naturally come to mind first when we hear Lipton's name, however, the septuagenarian has had a successful modeling career since she was a teenager as well. Today, you might also catch her on a red carpet supporting her inspiring daughter, actress Rashida Jones. "Comfort! I was a high-heels girl since my 20s, I knew how to balance and walk and they made clothes look amazing. I gave away almost every pair...the Manolos, Diors, Pradas, McQueens, and Louboutins. I had quite the collection. Now I can do a lower heel in a boot or pump, but not too low—I still love the length and sense of empowerment they give, even more than clothes. "But a sense of being stylish and feeling good in what you wear at this age comes from both within and watching fashion waves come and go. It all has value even if it's fantasy. Best of all is seeing women represented who have lived life. Uplifting!" Where you’ve seen her: Most recently, she’s been spotted on the runways of Osman and Simone Rocha as well as the pages of Italian and UK Vogue and the Netherlands’ issues of Harper’s Bazaar. However, fashion-history lovers will also recognize her as a prominent model beginning in the ’60s, working with photographers such as David Bailey and Norman Parkinson, and appearing in the pages of Mademoiselle, British Vogue, and Glamour. As far as personal style, I’ve never been interested in following trends, preferring to be more individual than fashionable. When I arrived in England in the late ’60s, I loved the way people dressed, sometimes a bit eccentrically, which seemed a unique expression of themselves and their characters. I’m thrilled fashion is becoming more inclusive, representing women of all ages, sizes, shapes, and nationalities. At 74, I’m more than just a “pensioner”! With two daughters and a 2-year-old granddaughter, I want to have fun with fashion, being adventurous but not taking it too seriously. Where you’ve seen her: Webb was a prominent model of the ’80s and ’90s, walking runways for the likes of Versace, Alaïa, and Todd Oldham. When she signed to be the face of Revlon in 1992, she also notably became the first black woman to have a major cosmetics contract. Today Webb continues to work along with Iconic Focus Models, as well as share her style through a personal blog called Webb on the Fly. I appreciate that all the things we fought for—I was the first woman of color to ever have a cosmetics contract—in terms of diversity are starting to become the norm. We are seeing women of all shades now. The push is for all ages and sizes to become part of the standard definition of beauty in the fashion industry. Webb on the Fly, my pro-aging fashion and beauty blog, is about appreciating the wisdom and discipline that comes with the maturity of finding and nurturing your own style. Where you’ve seen her: She walked the runway this past NYFW doing Ralph Lauren’s mega 50th-anniversary show and starred in a 2015 Miu Miu campaign shot by the iconic Steven Meisel. However, Moneymaker’s career spans over 30 years of commercial and editorial work, currently represented by Iconic Focus Models. My fashion style has always been classic, simple and clean. Of course, having such icons as Audrey Hepburn, Grace Kelly, and Jackie Kennedy to grow up admiring, it was a big help influencing my style. I grew up wearing a uniform, so I realized early in life the huge plus in simplicity and consistency. I use this lesson and translate it into the use of linen, silk, wool, and cashmere; they are really all that I wear. I like only solids colors—black, denim, gray, navy, brown, beige, white. If I love something, I usually buy at least two of them, unless it’s a one-of-a-kind piece. The best thing about buying quality classic pieces is they last forever. You just build on your wardrobe from year to year. Today, fashion has given me the confidence to keep my classic style but with a relaxed twist: mixing all these fabrics, evening wear, diamonds, pearls, T-shirts, leather, denim with cool flats, boots, heals—anything goes if you like it and feel comfortable. It’s a more relaxed and liberating freedom of expression. Next, take a look at the five pieces fashion editors never spend more than $100 on.